Delivering transformation in people's lives through our work for individuals; the third sector and public sector clients is at the heart of what we do. Our achievement in some of these areas is of national relevance and we've attracted a highly skilled team of people who are genuinely passionate in their field of work. We're proud to make a proactive difference in local communities and have been delivering market-leading legal expertise for over forty years. Take a look at our site to see how we can help or to find out more. 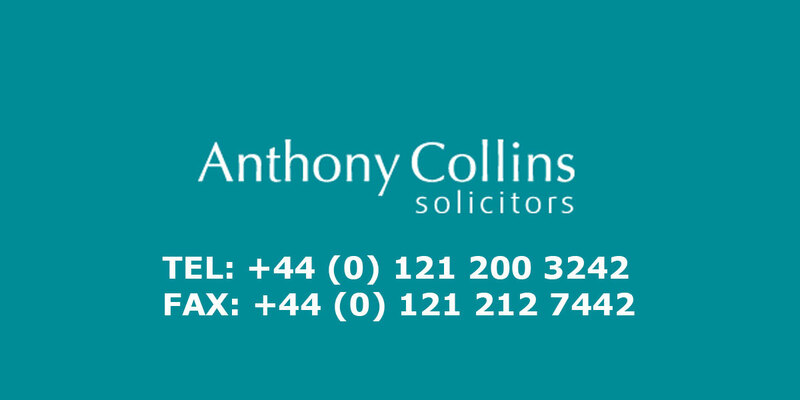 Anthony Collins Solicitors is an organisation with clear values and purpose (read more about our Culture and Values). We are a legal practice committed to excellence with a national market in areas including community regeneration, housing, charities and procurement. Our business is based in Birmingham where we also have a strong local presence, working alongside individuals, businesses and third sector organisations across the West Midlands and beyond. Committed to valuing and celebrating our people (see more about Our People here), we employ around 245 staff (see our Key Facts page) across a range of specialist legal teams.